For most people their marriage is an occasion for which they make special preparations and arrangements. They do everything possible to make it a memorable moment. 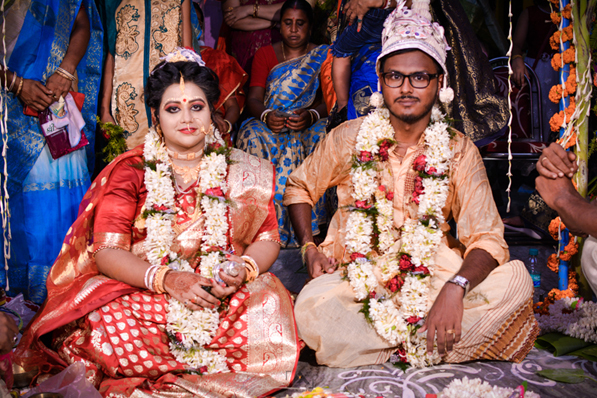 Red Cross volunteer Soumita Mondal, 22, did something out of ordinary to make her wedding not just special but an act of inspiration for the community. Hailing from Tehetta in West Bengal’s Nadia District, Soumita is an active member of Youth Red Cross. She has won laurels at the state and national level Youth Events and Exchange Programmes as an accomplished vocal singer and dancer. She also received an award at the National Youth Fest 2017 hosted by the IRCS National Head Quarters for her performance. As the family and friends started finalizing plans for the wedding day in July earlier this year, Soumita mooted her idea of holding a blood donation camp on the same day. 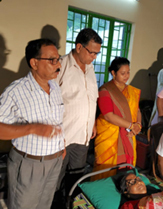 Her father Subinoy Mondal, a Mathematics teacher, and mother Dalia Mondal, an employee with the state health department, agreed and fully backed the decision. “Being a Red Cross volunteer, I am inspired by the spirit of service that drives our volunteers. Voluntary blood donation is an important activity that is organized by Red Cross across the country and I could not think of a better way to celebrate this day,” Soumita said. “I told my father that he shall arrange a blood donation camp through Indian Red Cross on my wedding day as a gift for my wedding, which will save lives of many," She added. “We know about Red Cross through our daughter as she associates with different activities that are organized through the local branch. I became the first donor and felt proud of her decision as a mother,” added Dalia, her mother. “Not only did we agree happily. Our daughter’s desire was also respected by the groom and his family and on the day of the wedding the venue turned into a blood donation camp with people offering gift of life,” Subinoy, her father said. On 6th of July, as a wedding gift, 25 invitees, including relatives, donated blood at a camp that was decorated with flowers and people dressed for the occasion. The young bride’s unique humanitarian decision and the support it drew from the two families attracted the local media who covered the event and shared the message of voluntary blood donation through the news reports in print and cable broadcast.